My opposition to the Atlanta Braves’ departure from their downtown home in Turner Field is well-documented in these digital pages, and it’s unlikely that we’ll make it to many games once the team moves to the corner of I-75 and I-285 (not exactly Michigan and Trumbull or 1060 West Addison). In the event we do hack our way through the asphalt jungle and make it to Cobb County, though, there’s good news. No, the team’s not likely to be much better next year, but at least Turner Field organist Matthew Kaminsky will be joining the Braves’ suburban exodus. It was good that we were closer to the game, too, because the Royals and Braves, who were off on Monday, were celebrating a belated Jackie Robinson day by having everyone wear uniform number 42 in his honor. This made it difficult to keep track of the players, particularly hitters and pitchers, a difficulty the apparent lack of an active stadium announcer compounded. Swinging hard in the other direction, though, was the overly detailed digital scoreboard in straightaway center that had almost too much information on it to be readily intelligible. Mitigating all of this, thankfully, was an organ player who kept the whole scene loose and made me smile by playing his or her own version of “Call Me Al” every time K.C.’s Alcides Escobar came up to bat. Kaminsky’s signature is his musical puns or references played for the opposing batters’ walk-up songs, creating a fun game within the game for fans trying to follow his thought process. Other memorable selections include “Take Five,” a Dave Brubeck recording composed by saxophonist Paul Desmond, for Washington Nationals shortstop Ian Desmond, and various fish-related songs for Angels outfielder Mike Trout. Kaminsky was a guest on a recent episode of The Ringer’s MLB podcast, hosted by Ben Lindbergh, which you can stream below. He discusses how he first was hired for the job; how he prepares for, envisions, and executes his role during games; and the particular musical equipment he uses. As mentioned above, he also discloses the news that he will be a part of games at the Braves’ new park next year, and that, as part of the move, the team will be supplying him with a real organ. The segment with Kaminsky begins at roughly the halfway point, and is preceded by a Statcast conversation with Daren Willman (Baseball Savant) and Tom Tango (The Book) that also may be of some interest. Kaminsky, who also plays for college teams (including Georgia Tech, Georgia, and Auburn), performs in a salsa band and a jazz band, and teaches music, takes suggestions for his baseball selections on Twitter. UPDATE: Approximately seven minutes after we published this post, the Tigers took our advice and traded Aviles to the Atlanta Braves. The Tigers have acquired infielder Erick Aybar for infielder Mike Aviles and catcher Kate Scivicque, according to the team. It’s reassuring to know that General Manager Al Avila has joined Brad Ausmus as an ALDLAND reader. If you would like to peer inside the mind of the Tigers GM, the original post remains below. The clock is ticking louder than ever on the Detroit Tigers’ 2016 season, and, just at the very moment the team needs to be putting its best foot forward in an effort to win crucial games that will determine whether they make the playoffs, they are running out some of the worst lineups they’ve used all season. 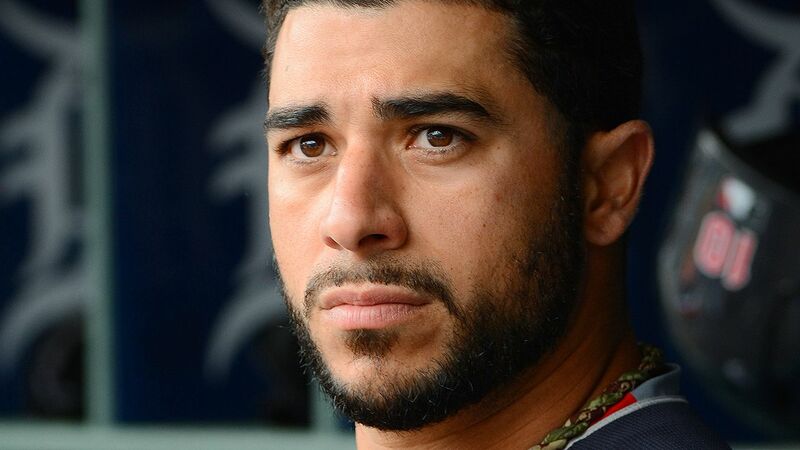 Injuries are largely to blame for this untimely suboptimal roster utilization, as Detroit currently is without Cameron Maybin, Nick Castellanos, Jordan Zimmermann, Jose Iglesias, Shane Greene, and (sigh) Mike Pelfrey. In addition, Miguel Cabrera left last night’s game with what appeared to be a left shoulder injury, and his status is uncertain. Manager Brad Ausmus, facing this many significant losses, obviously is handcuffed– he has little choice but to lean, undoubtedly more heavily than he would prefer, on his reserves, backups, and alternates. Modern MLB roster construction, with its emphasis on relief-pitching specialization, leaves little room for backup position players. The Tigers, like most American League teams, essentially have three: a backup catcher, and two other “utility” fielders, who can play a variety of positions whenever a regular starter needs a break, or as a defensive replacement late in games. Aviles is no longer useful in a baseball sense[, and] his inability to reach base (.279 OBP from 2013-15) makes him a complete zero on offense, while what’s left of his defensive and baserunning abilities have become liabilities. You don’t have to if you don’t want to, of course, but if you would like to hear me on the latest episode of the Banished to the Pen Podcast, listening is required. Baseball discussion topics include my recent research on switch hitters and the defensive shift, as well as the new book from Ben Lindbergh and Sam Miller, The Only Rule Is It Has To Work. The podcast episode is available for downloading or streaming here. Early in Victor Martinez’s career-renaissance season, that being the 2014 Major League Baseball season, I expounded– in a manner so brief it likely took less time to read than the length of an average Martinez plate appearance– upon one component of the (i.e., Rod Allen’s, colloquially) notion of Martinez as a “professional hitter”: Martinez’s ability to extend his plate appearances. I contended that one of the team benefits of Martinez’s approach is that it pushes pitchers to reveal more of their arsenal earlier in the game. In looking for general evidence of this beneficiary concept by inverting the point of focus from hitters to pitchers, I found Ben Lindbergh’s recent analysis of pitcher performance. The broad, basic point: within a game, pitchers perform worse each subsequent time they face a batter. The times-facing-hitter penalty isn’t as much a fatigue effect as it is a familiarity effect that compounds as hitters have time to study their prey. While many will be watching Martinez for the wrong reasons this season, keep an eye on him and his ilk to see whether they can continue to help their teammates in secondary ways, regardless of what happens to their own primary production. Baseball Notes: Rule Interpretation Unintentionally Shifts Power to Outfielders?